TG assemblies with fiberglass-insulated thermocouple wire are specially designed for applications where the sensor wire is exposed to process temperatures reaching up to 900°F (482°C). This assembly is particularly targeted for use with vacuum and/or inert gas back-filled furnaces with vessel wall temperatures up to 200°F (93.3°C) and pressures not exceeding 300 psi. The assembly consists of bonded fiberglass-insulated/silicone impregnated thermocouple grade wires on the body side, with stripped bare wires passing through the Conax-manufactured transducer gland. An alternative high-temperature fiberglass for Type K wire is also available with temperature capabilities up to 1400°F (760°C), see TGM. Sleeved insulation material on the wires exiting the cap side may be fiberglass/silicone impregnated or polyolefin. Feedthrough bodies, caps and followers are constructed from 303SST. Cap Style A offers a mounting thread only. 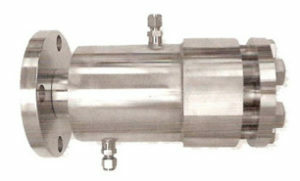 Cap Style B provides threading on both ends for attachment to conduit or terminal heads. These assemblies are offered with Viton sealants. Alternative sealants are available. 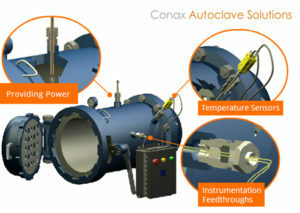 Please consult a Conax Technologies sales engineer for custom needs.